I enjoyed reading the first three books in Ben Aaronovitch’s “Peter Grant” series, there’s something addictive about them and they were all great fun to read, even if the two sequels weren’t quite as good as the original “Rivers of London”. The fourth book in what looks to be a long running series continues that trend, it is another entertaining read although again it is falls slightly short of being as good as it perhaps could have been. I thought the book took a while to build up momentum. The early stages of the book consist of a series of loosely-linked investigations into various crimes and mysterious happenings, all with the ultimate aim of tracking down the series’ main antagonist, the sorcerer they know only as the Faceless Man. Periodically these investigations are interrupted by subplots revisiting some of the plotlines introduced in previous books such as Peter providing police cover for a magical ceremony held by the river spirits of London or the Folly’s caretaker Molly behaving mysteriously. I do like the hints of happenings in the wider magical world but it doesn’t help with the pacing of the novel and arguably not enough happens in these subplots to really justify their existence in this book. Another small problem is that although it’s nice to focus on the Faceless Man storyline again, the various crimes investigated in the first part of the book aren’t all that interesting in their own right. The pace picks up as the book moves past its halfway point when Peter and Lesley go undercover in Skygarden, an unloved post-war housing estate which seems to be the focus of the Faceless Man’s plotting. As the book progresses the various plotlines and investigations start to come together leading to possibly the best finale in the series so far. Two particular highlights of the story are Peter’s boss Nightingale getting a chance to show more of his powers than he has in previous books and an intriguing final plot twist which is surprising but also makes a lot of sense given earlier events. Although the series as a whole is a relatively light read it does manage the occasional shocking moment and there a couple of moments like that in this book. The ending does make me keen to read the next book in the series, although it remains to be seen whether it will focus much on the overall story arc or whether it will be more of a standalone story like “Whispers Underground”, the previous book in the series. The characterisation continues to be one of the highlights of the series and Peter continues to be a compelling narrator of the story. His occasional tendency for his narration to get sidetracked into discussing things that interest him is charming and it works well in this case as his interest in architecture has a lot of relevance to the plot when he investigates the mysterious legacy of the architect who designed Skygarden. The supporting cast continues to be good, with Lesley in particular getting some good characterisation in this book, although it’s slightly frustrating that we don’t learn much more about Nightingale, who is possibly the most interesting character in the series. The copy of the book I read had a bonus short story with Peter and colleagues investigating a haunted bookstore. It’s a slight but mildly amusing story, although its placement is a bit disconcerting, since it is at the end of the book despite clearly taking place before the events in Broken Homes. 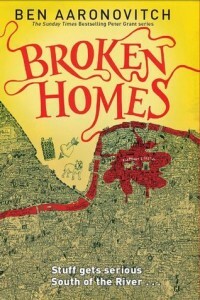 Overall, Broken Homes is another entertaining novel which takes a while to get going but once it does it delivers one of the best stories in the series so far.